Paint disposal can pose a real challenge. You cannot dispose of paint in it’s liquid form but If you do a fair amount of painting around your home you can quickly accumulate paint you no longer have any use for. Most cities have a disposal center for people to drop off old paint. In most cases it is a free service. In the Omaha market we have such a place. I have always found it strange that paint contractors are banned from using their service. If you think about it, who is going to have more paint and a need to dispose of it properly? What they do at these places is sort through the paint and mix like types and colors with each other, strain the paint and offer it back to the public. The bad stuff they dispose of. Most of these places also take pesticides, etc. If you are a homeowner, check and see if one of these facilities are available to you. If there is one, it is your first choice for dealing with extra, old or unwanted paint. If you do not have access to this type of disposal then here are some ideas for you. 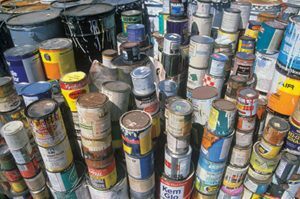 If the paint is dried out it can be thrown into your trash. The trick is in drying it out. Some people suggest putting kitty litter into the paint to dry it out or sawdust. These are good ideas but I’m not all that excited about buying kitty litter so I can turn around and throw it away and you may need a lot of kitty litter. That can get expensive. If you have access to lots of sawdust, problem solved. I have thought about contacting a wood hobby shop to see about getting some sawdust but I imagine they have a use for it if they are generating it in large quantity. At The Painting Company we have constructed a large platform. It is about 4 feet by 8 feet with about 5 inch deep sides. We lined this with plastic and we dump paint we want to dispose of into this platform to dry. It dries fairly quickly and we have disposed of lots of paint this way. Over time you just dump paint onto the dry stuff in the platform. Eventually you roll up the plastic liner and throw it out. If you don’t want to build a set up like this, or smaller, something that works well is to open the paint container and put extra or left over pieces of drywall into the bucket. We cut pieces about 4 inches wide by about 1 foot long. you can take several of these pieces and put them down into the container. The paint dries out very fast. Then just throw it away. Scrap drywall is easy to find on any job site and best of all it’s free! Paint disposal just takes a little thought to do it right. Other things that work are fireplace or grill ashes, dirt, etc. Sometimes you need to stir things a bit. The larger the surface area of the paint mixture, and air movement, speeds things up so dumping the mixture into a larger container or onto newspaper with plastic under it helps.